Honda two wheelers today introduced its new product Honda Aviator that is powered by 110cc engine. The company launched it in two variants- Honda Aviator 110cc and Honda Aviator Deluxe. This is the second scooter launch by Honda in the year. The company unveiled new Honda Activa a few months back in India. New Honda Aviator is loaded with the same mill that is present in Activa. The new gearless scooter is equipped with 110cc powertrain and belts out 8 bhp of peak power at 7500 rpm and churns a maximum torque of 9 Nm at 5500 rpm. 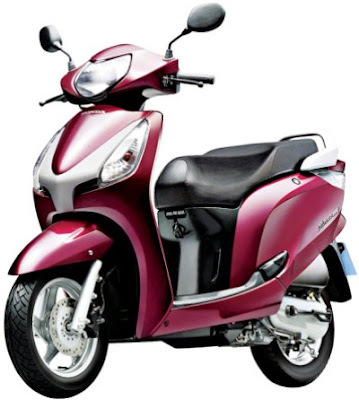 The same combi brakes system and key shutter system are borrowed from the Activa to New Aviator. Honda Aviator is priced at Rs. 42160/- and Honda Aviator Deluxe's price tag is Rs 47,000 in Delhi. The new Aviator is priced Rs 6,000 higher than the Honda Activa but proves its worth. The scooter will be available in five shades- Monsoon Gray Metallic, Rebel Red Metallic, Pearl Heron Blue, Orange Metallic and pearl Black. Honda launched a new version of Aviator due to recent launches by Mahindra- Mahindra Duro and Mahindra Rodeo. The scooter is available in five stunning hues viz., Pearl Igneour Black, Berry Purple, Monsoon Gray, Space Silver and Rebel Red. Honda Aviator is already there with front disc brakes. On the other hand, Royal Enfield is expected to roll out its Royal Enfield Bullet Classic in the first week of November.